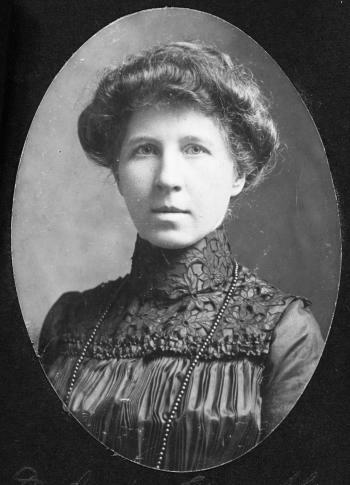 Annie Lowrie Alexander born in 1864. Image courtesy of the North Carolina Office of Archives and History, Raleigh, NC. Annie Alexander has a unique place in history: the first female licensed to practice medicine in the South. Annie was strongly influenced by her father, a physician himself, who determined that she should become a doctor after one of his female patients died after refusing medical attention out of fear of being examined by a man. When Dr. Alexander told his wife of his desire to have Annie become a doctor, Mrs. Alexander fretted over bearing the cost of medical training, only to have Annie marry and forgo a career as a physician. Dr. Alexander’s response was blunt: “She must never marry. She’ll serve humanity”. Only three years later, after beginning her studies under her father and a hired tutor, Annie entered the Women’s Medical College in Philadelphia at the age of seventeen. She graduated in 1885 and moved to Baltimore, where she had accepted both a position teaching anatomy at the Women’s College of Baltimore and an internship at the Baltimore Children’s Hospital. Annie received her medical license the following year, earning the highest grade in a class of 100 students. It was during this time that she contracted tuberculosis. Plans were quickly made to send her to her uncle’s home in Florida to recover. After spending a year recovering, Annie had regained her strength and was able to move back home to Charlotte. After passing the state licensing examination, Annie began a 40-year career serving the medical needs of her fellow North Carolinians. In 1889, she decided to purchase a small one-story home in Charlotte. Since there was only one hospital in the area at the time, Dr. Alexander’s home was eventually remodeled to accommodate patients when the need arose. Dr. Annie Alexander truly made her mark on the medical profession. She was elected in 1909 for the first of several terms as president of the Mecklenburg County Medical Society. She also served on the boards of both Saint Peter’s Hospital and Presbyterian Hospital in Charlotte. She was active in the community, supporting civic organizations like the Charlotte YMCA and the Florence Crittenton Maternity Home. During World War I, Dr. Alexander received a commission with the Army and worked in the U.S. Health Service. Annie Alexander passed away on October 15, 1929, after contracting pneumonia from a patient. True to her father’s early prediction, Dr. Annie Alexander used her life and talents to serve humanity — and by her determination, compassion, and perseverance, set a positive example for male and female doctors alike.